Antiques Roadshow: The Game is a trivia game basically made exclusively for antique dealers. 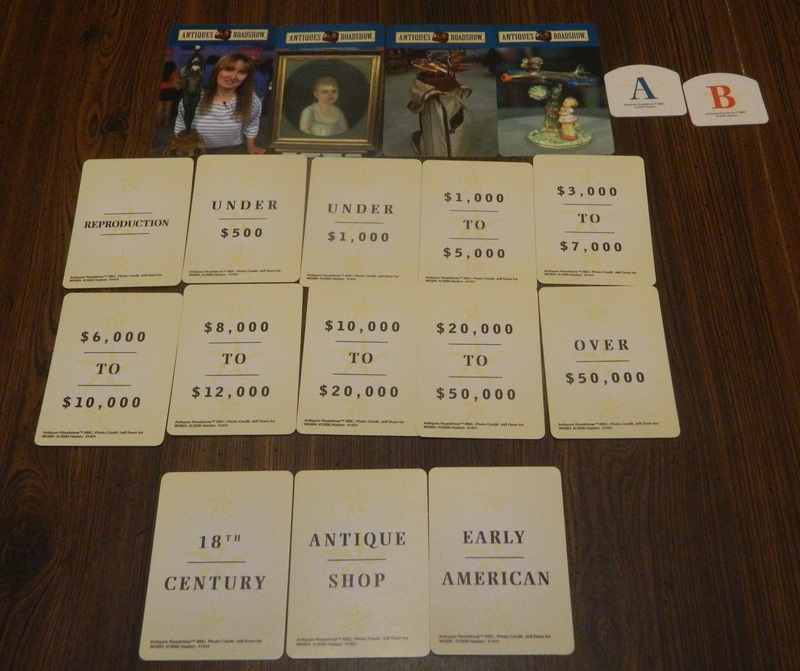 The object of the game is to get rid of all of your cards by guessing the correct value and history of some of the antiques shown on episodes of the popular PBS show. 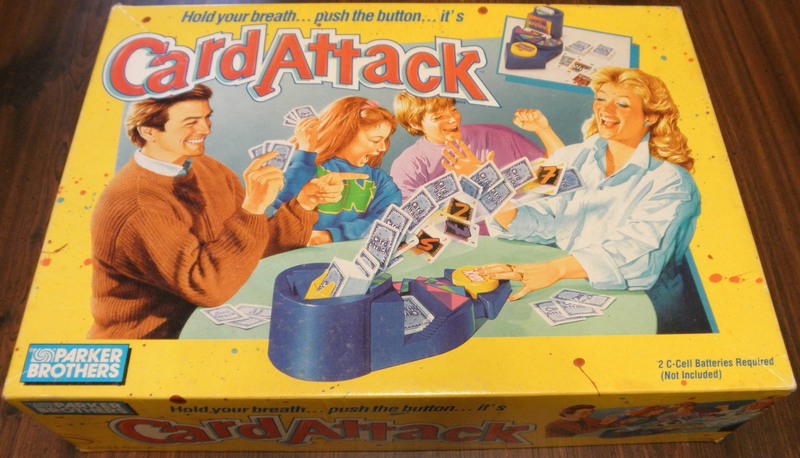 To start the game, players are dealt antique cards (four in four-player games, six in three-player games, and eight in a two-player game) and three antique speak cards. 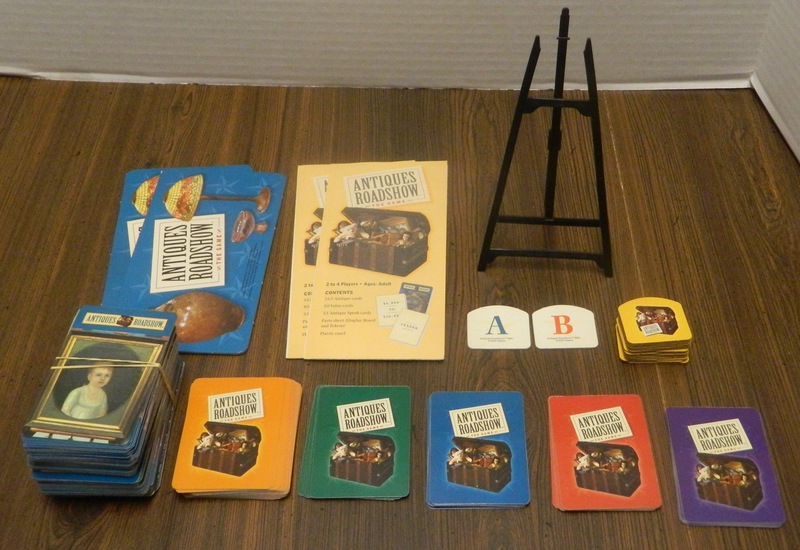 They are also given a set of ten different value cards and “A” and “B” tokens. The antique cards should be placed face up (with the picture of the item showing) and players must not look at the story side of their cards. However, they should look at the pictures of the items (including the antique cards owned by other players) and if they recognize any of the antiques and know its history and value, should replace it with a new antique card. This is an example of all of the cards each player gets to start the game. The four top cards are antique cards, the ten cards underneath are the value cards, and the bottom three cards are the antique speak cards. After this, Antiques Roadshow: The Game begins. The owner of the game goes first and selects one of their antique cards. They place it on the easel and all players study the picture of the antique. Then, all players (including the current player who selected the antique card) select a value card that they think will come closest to the antique’s actual appraised value. Every player gets the same ten value cards (reproduction, under $500, under $1,000, $1,000 to $5,000, $3,000 to $7,000, $6,000 to $10,000, $8,000 to $12,000, $10,000 to $20,000, $20,000 to $50,000, and over $50,000). If two or more items are shown on the card, players should choose the value card that best represents the entire collection. Players place their chosen value cards on the table facedown. 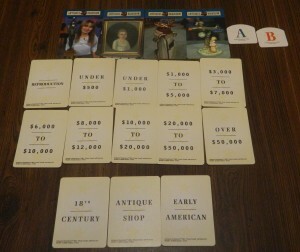 After all players have selected their value card, the current player turns over the antique card and reads two possible stories about the item’s history and value. All players should listen carefully for two reasons. First, of all they should be listening to see if any of the words on their antique speak cards are said (sample antique speak cards include “18th century,” “silver,” “European,” and “rare”). If one (or more) of the antique speak card words are said, those card(s) can be discarded (and the player(s) also gets to discard any value card they wish). The other reason to pay attention to the stories is that all players (except for the current player because they will see the answer) will get the chance to decide which story is true (story A or story B). All players play the token that corresponds with the story they think is true. After that, the current player reveals the true story and the actual appraised value. 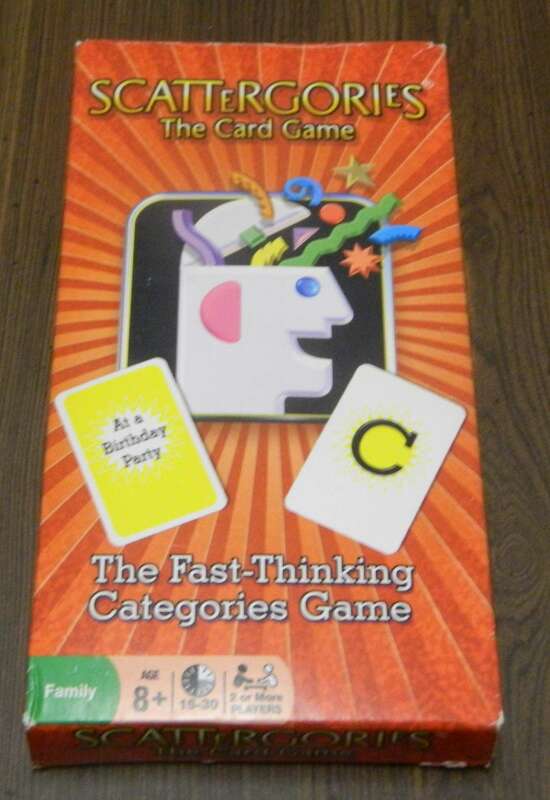 All players who selected the correct story may discard any card they choose (either a value card or antique speak card). Also, any players who played a value card range that the antique’s actual appraised value fits into (at the start of the round) gets to discard that value card. This is an example of how to “score” a round of Antiques Roadshow: The Game. The top card is the story side of this round’s antique card. 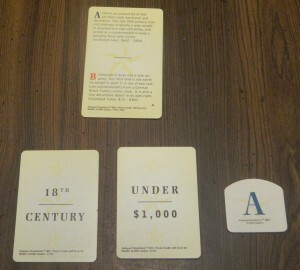 18th century is an example of an antique speak card that can be discarded since it is said in the “A” story. The correct story is A so all players who played the A token get to discard any card they choose. Also, all players who played either the under $500 or under $1,000 value cards get to discard that value card. After everybody has discarded all the cards they can, the round is over and play continues to the person to the left. Each turn is played the same way. To win the game, you have to get rid of all of your value cards, antique speak cards, and possibly antique cards (the rules don’t specify). We played without having to get rid of the antique cards (since a player had already gotten rid of all of their other cards and would have just had to wait for it to be their turn two more times). However, the game simply says the winner is the first to discard all of their cards so I’m not sure we played correctly (though it would be pretty stupid to require players to get rid of their antique cards). Antiques Roadshow: The Game also has some rules for players who wish to play along with the TV show. Players still get the full set of value cards and three antique speak cards. However, instead of playing with antique cards you play with the antiques shown on the episode of Antiques Roadshow you are watching. Players try to guess the value of the items using their value cards and also listen to see if one of their antique speak words is said on the show. Antiques Roadshow: The Game is basically a trivia game made for antique dealers. I could see it being a fun game for them, but not so much for other players. I’m a collector with a generally good eye when it comes to collectibles but even I (as well as everyone I played with) pretty much had to just guess on every antique card that came up. 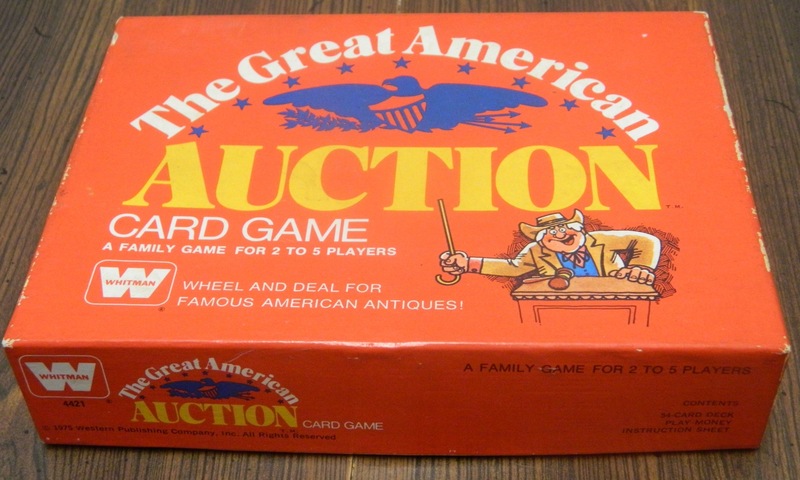 The game is very hard unless you are an antique dealer or serious collector of antiques. When a significant portion of players are just going to be basically playing a glorified guessing game, you know it isn’t a very good game. In addition to being mostly a guessing game, Antiques Roadshow: The Game also adds an even more heavily luck-based mechanic in the form of the antique speak cards. These are very unbalanced, some of the words (like 19th century or 20th century) are on a large majority of the antique cards while others only appear to be on a small handful of them. Since you need to get rid of all of these cards (in addition to all your value cards) and getting one of your words said allows you to discard a value card as well, if you get infrequently used antique speak cards you almost certainly are going to lose. You can get rid of troublesome antique speak cards by guessing the correct story but it’s pretty wasteful (especially since if the word is said you can get rid of a bonus card) and will put you behind. As an example of how unfair the antique speak cards can be at times, one of the players in our game got three extremely easy ones which they got rid of in about three rounds. Since you get to discard an extra card for each, this means they were able to get rid of almost half of their cards (six of their 13) just like that. Meanwhile, another player got stuck with terrible antique speak cards which were never said in the entire game. Not surprisingly the fortunate player won the game while the other player got rid of only a handful of cards before the game ended. These cards are completely luck-based and can really unbalance the game. I also think the rule about replacing any antique cards that players recognize is pretty dumb. First of all, since the antiques come from the show if you are an Antiques Roadshow junkie you might not even get to play the game (since you might recognize all of them). Also, I personally think that if you recognize the item you should get the advantage (since it shows you have a knowledge of antiques). It’s unlikely you will know the exact value of the item anyway. This rule can obviously be ignored, and I actually suggest you do so. Antiques Roadshow: The Game comes in a nice “collectible” tin. Unfortunately, when the box is one of the game’s best features, it’s not a good sign for the quality of the game. The game comes with 162 antique cards, which is quite a lot. You can easily get ten games out of it before the antique cards start repeating. 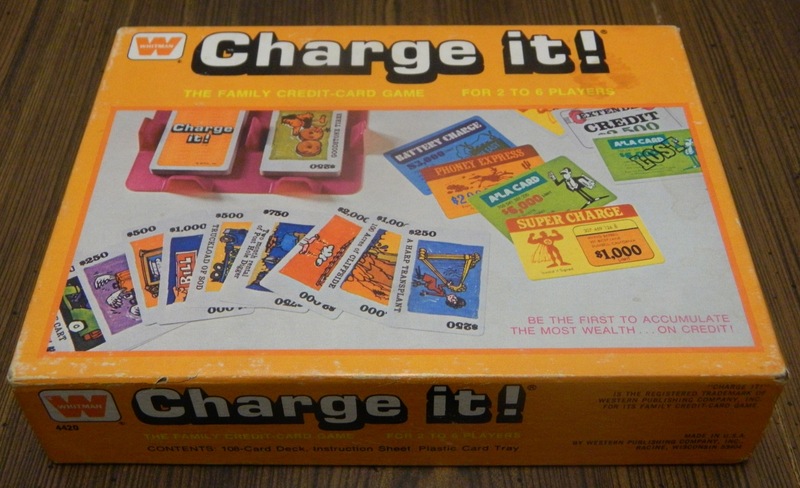 However, the game doesn’t have a lot of re-playability after you’ve played all of the cards (unless you wait a couple years to play again so you forget the antiques and their values or you just play the alternate TV show rules). 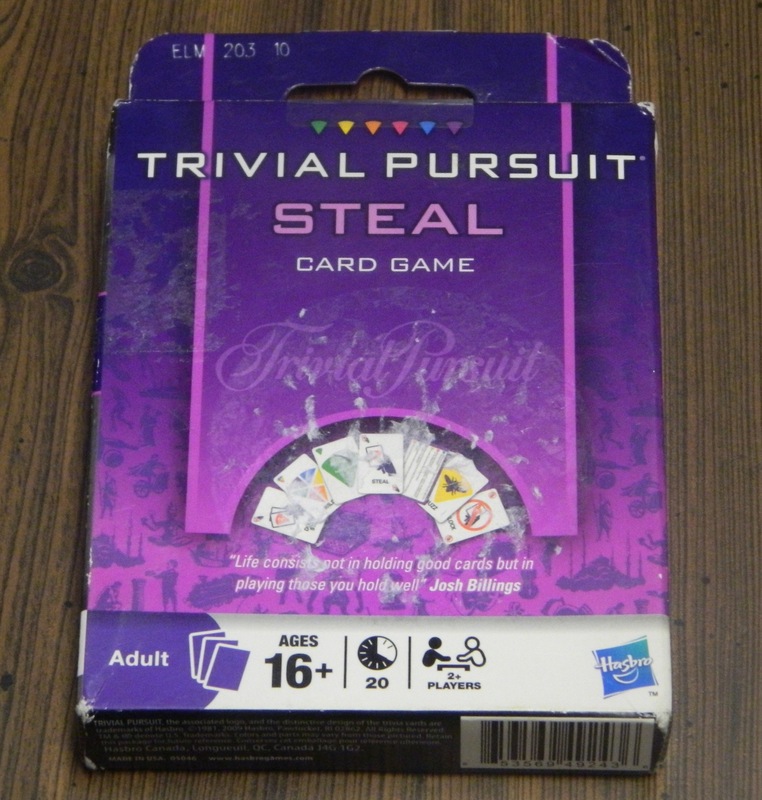 The game is very cheap (there are several new copies for $3.00 plus shipping on Amazon at the time of this review) and easy to find at thrift stores though so it won’t cost you much. 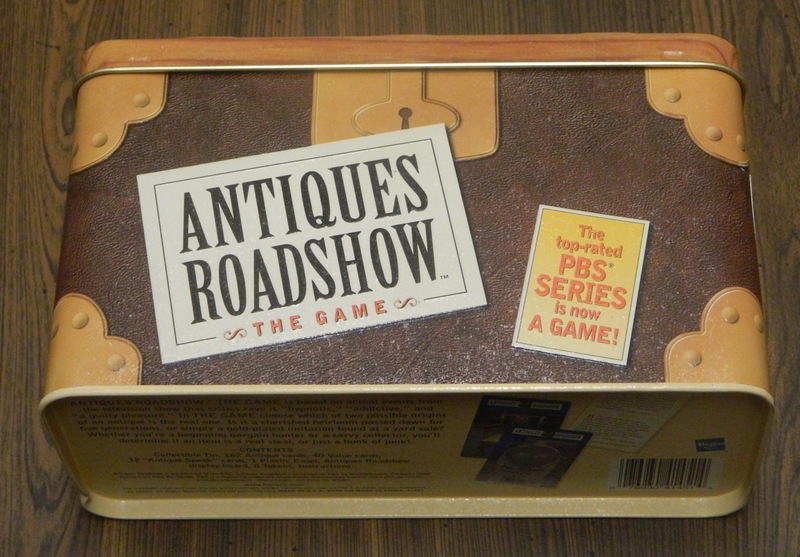 Even though some of the rules of Antiques Roadshow: The Game are pretty stupid and the game can become pretty much a glorified guessing game, I have still played much worse games. However, this game is definitely below average and mostly just for antique collectors, dealers, and huge fans of the show.